Despite the presence of She-Hulk, the first wave is not difficult. Thunderball will take two turns per action and Bulldozer one, and they'll attack often dealing Weakened, Slowed, Exposed and Dizzy (some of their attacks have Paragon Exploiter too). The best way to fight is to use the She-Hulk's and Thundra's stunning attacks as much often as possible (Thundra should use Rolling Thunder every other time, in order to have a chance to remove Thunderball's debuffs thanks to the Rising Up effect), while Tigra should fight with her proper setup (Swipe-Frenzy, Swipe-Tiger's Fury, Swipe-Razor Claws etc.). The second wave features Piledriver and the Wrecker: this is the battle's real enemy, since he's Relentless, his attacks and Piledriver's can deal stat-reducing debuffs,s and his Crowbar of the Gods attacks has Paragon Exploiter (never attack him with Tigra). This is the moment to pump Thundra's Perfect Storm, while Tigra and She-Hulk should focus their attentions on the Piledriver: if Thundra is properly buffed and the Wrecker properly debuffed, even a single Perfect Storm should kill him with ease. In this battle, Hydra made X-23 gone berserk with a massive amount of trigger scent... and Kitty Pryde will fix things up. As for almost every Heroic Battle, having Kitty's Shadowcat alternate outfit (obviously not the Scrapper version) will make things easier. Remember to put a lot of ISO-8 on the girl's health, plus on evasion and attack. If Kitty wears her default outfit, she should begin the battle with Call Lockeed: Burning damage will pratically negate her Healing Factor (already weakened by her Corrupted Scent debuff), and reduce her defense. X-23 will then give herself a Bloodhaze effect, which means only one thing: Kitty should use Phased Attack, because in the next turn the adamantium girl will use her powerful Made for Walking, which will be completely avoided by being Phased. After that, X-23 will start using her other attacks, based on the Bleeding debuff: the best thing to do is then exploiting the Phased status with a powerful Sneak Attack, then using Shadow Kick to reduce enemy's defense, restarting then the sequence (Phased Attack - Call Lockeed - Sneak Attack - Shadow Kick - Phased Attack etc.). With the Shadowcat costume, things to do are a bit different: Kitty should always open with Call Lockeed, but since she's Phased from the beginning it'll be necessary to use Sneak Attack on the second turn (instead of the third), taking the damage of X-23's Made for Walking. Things will anyway be easier because of Kitty's Strike From the Shadows ability, and after this first turns the attack sequence remains the same. 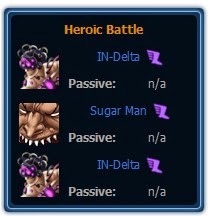 This battle requires an Invisible Woman at least at level 9 to be won, with the other two heroes at least at level 2. Alternate costumes, as always, can make the battle a lot easier. Ironclad will use Harden Enhancement, reducing damage of ranged attacks, but becoming vulnerable to melee attacks. 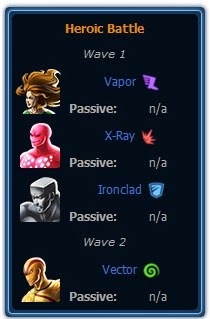 This buffs are also the enemies' main weakness: as you can guess, Susan should constantly use Force Cage on X-Ray, making him lose his turns and take great amounts of damage; Johnny should apply Burning to Vapor and then hit her with Fireball; lastly, Ben should use Stonewall whenever possible, punching Ironclad whenever an extra turn is gained. On the second wave, Vector will make his entrance and buff himself with Kinetic Enhancement, reducing damage from melee and ranged attacks, applying Radiation Exposure to the Fantastic Four at every round... and being vulnerable to Force Cage. The Pharoah has a buff that will cause him to gain power if hit by Plasma Wave, also, Plasma Wave does no damage to him in this fight. So avoid using it. Havok's first move should be to use Shattering Punch on the Pharoah. You need to keep Shield Breaker on the Pharoah or the fight will be a lot more difficult. Bishop's role is to do as much damage to the Pharoah as he can. Any method works as the Pharoah has no counters to Bishop's moves, and the Pharoah will usually give Bishop an energy charge each turn. Two In-Delta will always go first. Each of them will take two turns. One of them will be attack on Fantomex. Second In-Delta will give Fumbling on any of the Allies. If an attack is Stealthy, Fumbling can cause a counter-attack! If Fantomex has Fumbling applied to him, all of his attacks will cause a Counter-Attack. It might be a good idea to just Recharge. If Fantomex does not have Fumbling applied to him, use Fantôme on an enemy who ALREADY has Combat Reflexes, in order to not apply Combat Reflexes to an enemy so that the allies can target that particular enemy. If Spiral has Fumbling appplied to her, just use Macabre Fandango because it is a subtle Area of Effect and will not provoke a Counter-Attack. If Spiral does not have Fumbling applied to her, pick one opponent and use Flashbolt on an enemy who does not have Combat Reflexes. This will make sure that enemy can no longer apply Debuffs and set her up with Dance Magic Dance the next round and she can Buff all Allies and Debuff all enemies. Time Spiral may also work, as it sets up another Subtle Area of Effect attack. If Psylocke has Fumbling applied to her, use Mental Coordination to boost stats and coordinate attacks. If Psylocke does not have Fumbling applied to her, use Telekinetic Katana on an enemy who does not have Combat Reflexes. Keep a similar strategy through each round. Just remember to be patient, your goal here to is avoid Counter-Attacks and strike with Stealthy/Subtle attacks when possible. the method for the FF is well known bet still can't win cuz IW die very quick...what should i do? I have followed the hints above but still can't win Mission 3 - Up a Tree !! any other good hints ? can't figure the u-foes one.. sue keeps getting hit way too much, and force cage isn't doing nearly enough damage.. *sigh* does this mean I need to level them up to level 12 each? same case here, mine HT -- LV12; IW -- LV11 and Thing -- LV11; Vapor has 2 truns and hits 3 hero very much every turn !! too hard !! I didn't liked to do it, but i spent 30 cp for white suit for Sue, and it worked nice. That provides Thing to a shield, improving the stone wall and another tricks. Before that i couldn't beat this heroic battle; neither with level 11.
i've finish it and it works. i just finish ff heroic battle with HT lv 10 (no costume), IW lv9 (future costume), TT lv1 (yeah,i just bought him lol,with future costume ofc)..fail at first time but success at second time after I read this post. first, use HT l1 skill on vapor and next turn with l2 and it should finish her.IW keep using l9 skill on X-Ray until he dies (hell yeah).and The Thing (while he is lv1 in my team) keep using l1 on iron clad and HT will help him with ironclad when vapor is done.next is vector,he will get buff but you should use IW l9 on him and he get out of it since he has 2 turn but he will attack IW and since IW is buff with future costume (in round after 4) and inf class buff,she should be able to finish him. 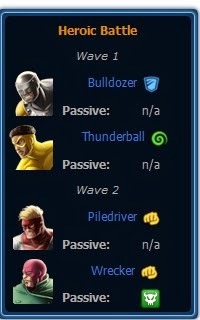 Hope it can help :)..
Ok, I am stuck on a Heroic Battle, how do I get Invisible Woman to the second wave? I mean every time I do this, she is always damaged some how and since I can't heal them it's hard as hell. What do I do? They all have the Future Costumes, & they are all at least lvl 12, what am I doing wrong? Chris, this isn't working, for some reason Vapor is able to get thru the shield and still cause massive damage to IW, is there some empowered ISO or augmented ISO I should use for the FF to beat the U-Foes?? ?